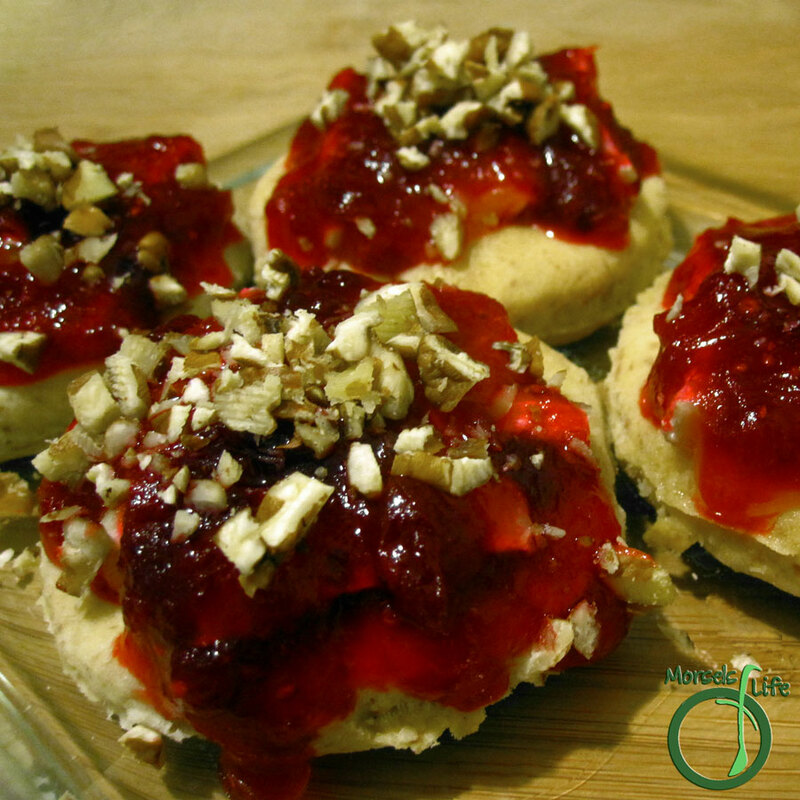 Creamy Brie cheese on top of a just baked biscuit enrobed in a tart, yet delightfully sweet cranberry chutney. I recently indulged in some fantastic, buttery biscuits, and while I do enjoy them by themselves, it's fun to try a twist on a beloved baked good. Using materials I had lying around, I found this fun way to spruce up the ordinary biscuit. You'll surprise yourself with how quickly you'll transform flour to tasty biscuits. I found myself waiting for the biscuits to finish baking rather than the cranberry sauce to finish cooking. (Is this a sauce or chutney?) While the chutney brings in its anticipated sweet and fruity qualities, it seems to harmonize with the decidedly creamy elements of both biscuit and Brie. I did try one with the Brie rind on, and I found it ok, but James thought the rind robbed the palate's attention from the stars of the show. Nevertheless, I say customize it to your heart's content! What about you? Do you cut off the rind or leave it on? Roll out dough on a well floured surface, and fold over 3 times. Cut out biscuits. You should get 10-12 biscuits. Bake at 450F until golden brown and delicious, about 10 minutes. Once biscuits cool sufficiently (but just barely!) cut biscuits in half horizontally. Place cheese on biscuit, and then top with cranberries and walnuts. Thank you for linking these to Must Try Monday! These are so pretty, and a different twist on using biscuits. These look so good. I will have to give them a try.